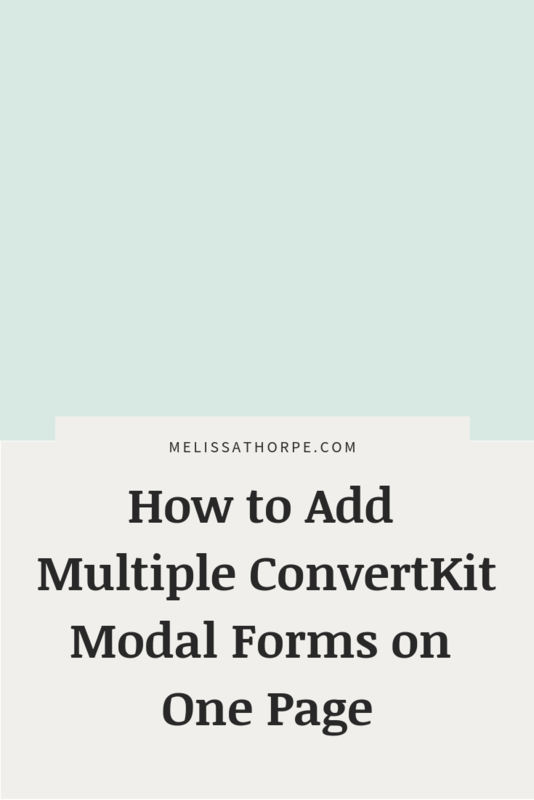 If you’re looking to display multiple ConvertKit modal forms on a single page of your website, you’ll find out pretty quickly that it doesn’t work because, by default, ConvertKit only allows you to display one modal form on a page. If you’re wondering the reason why this is, it’s because when you trigger the modal form (via link or image), the trigger is looking for the form ID and each form in ConvertKit has the same ID. So when you add multiple triggers to the same page, only the first form will appear regardless of which trigger you click. There is a workaround for this though and this tutorial will show you how it’s done. (If you’re more of a video person, scroll to the bottom of this post to watch the video walkthrough). So you might be wondering why you’d want multiple ConvertKit modal forms on one page. Well, it is actually more common than you think and it could occur unintentionally. 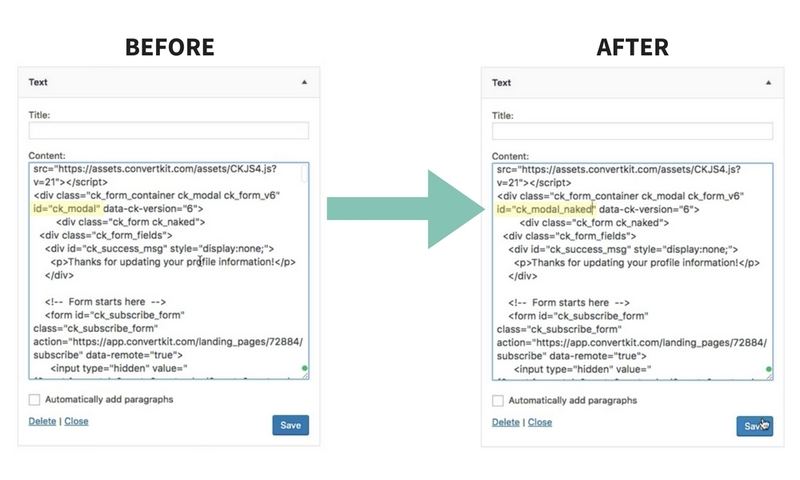 For example, a link to a modal form in both your website footer and sidebar or an image in your header that links to your opt-in modal and a link in a post that links to your content upgrade modal. In both of those scenarios, you have one or more triggers in a “global” area of your website (ie. 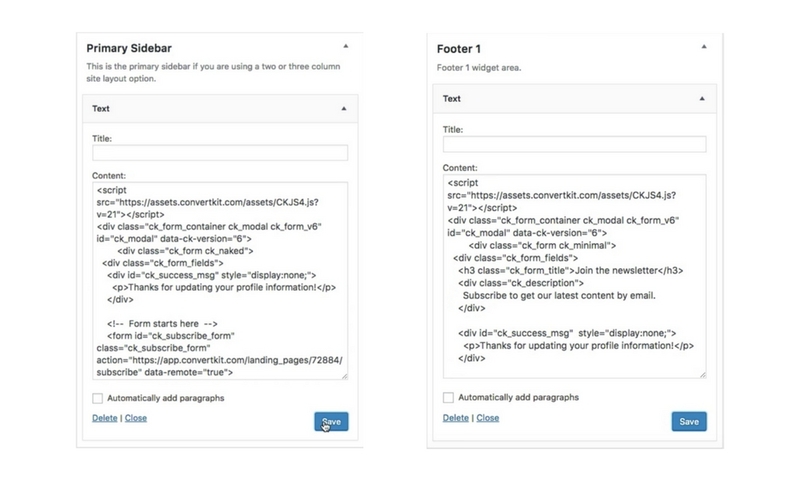 header, sidebar, or footer) and then another on a page-specific area of your site (ie. a post). Another option that I’ve seen a lot for modal forms is creating a freebie library. If you have multiple freebies that you want to display on the same page, you’ll want each freebie to trigger a unique modal. Luckily, the workaround is pretty simple and easy to implement regardless of the scenario. 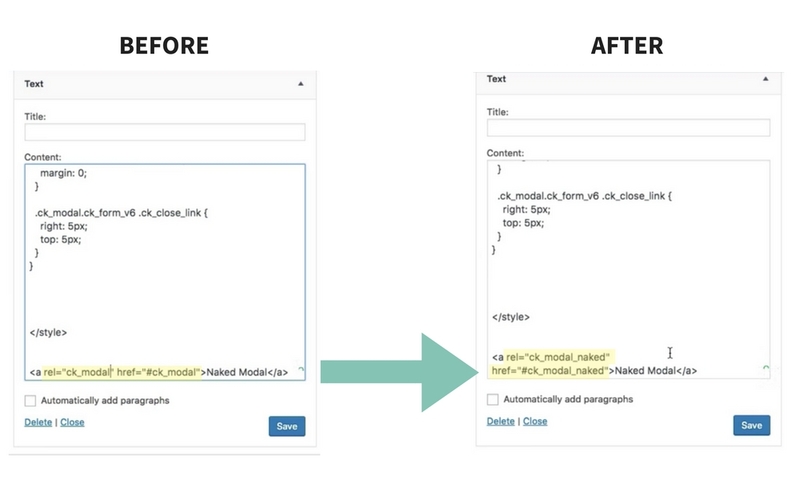 The short gist: by using the HTML embed and giving each form a custom ID while also updating the triggers to match the ID, you’ll be able to trigger multiple modal forms. 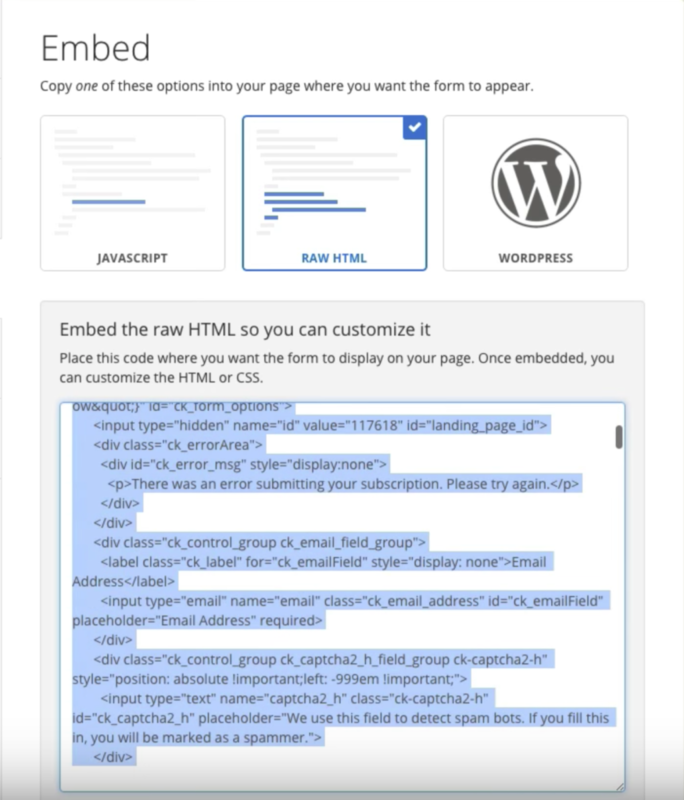 By taking the raw HTML code embed code option that ConvertKit provides, you are able to customize it to fit your needs. For the purposes of this tutorial, I pasted the code into a sidebar and footer widget of my website. In ConvertKit, under the form Settings, click on the Style tab. You’ll see the Display Options. I always set the timing to a large number (ie. 999999) so the modal won’t appear on it’s own. Here you’ll also see the code provided for triggering the modal with a link. If you want to add a trigger with an image or button, you can follow my tutorial here. 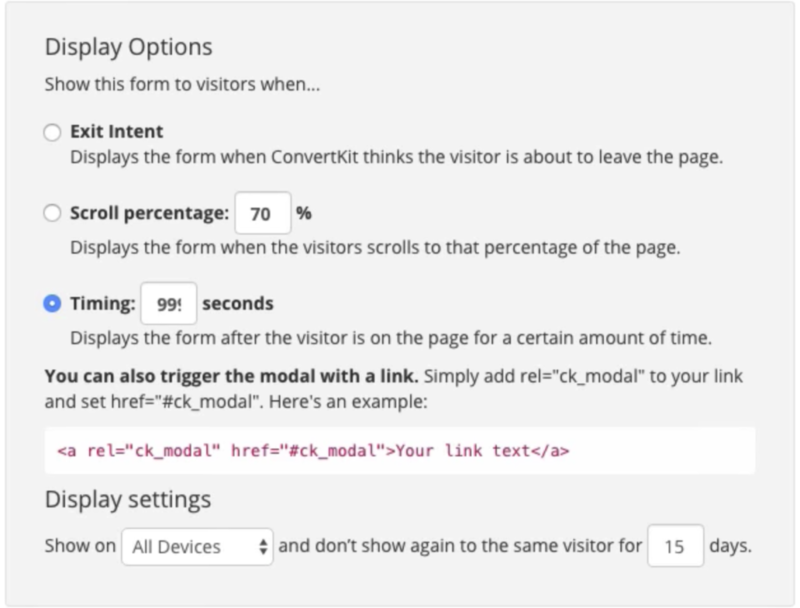 Add your modal trigger to your website, just below the HTML you pasted in earlier. If you only have 2 forms, then you’ll only need to change one ID to make both unique. If you have a freebie library, for example, you’ll want to change all of the forms so it’s easier to keep track. To do this you’ll need to edit the code in 3 spots. As you can see, I changed one of my forms to have the id “ck_modal_naked”. I left the other form as the default “ck_modal” (not pictured). That’s it! Once everything is saved, you can visit the page on your website and test out each modal. If you’d like, you can watch me walk through the entire process in the video tutorial below. Hi Melissa, this is awesome! Thank you so much. I have (very) limited coding working knowledge and yet have managed the HTML embed ID change because of your tutorial. Thank you! Do you have a tutorial on how to do this? Hi Rebekah, Sorry for the delay in my response. I’ve been on vacation. It looks like you were able to figure out the CSS because the opt-ins look great to me! If you’re still having trouble though, let me know and I’d be happy to take a look! Thanks for the great tutorial. If I’m not using a widget, where would the HTML code go in my page? Thank you, Melissa! My wife Sophia pointed me to your blog post to fix this CK problem on my own squarespace site and now it’s perfectly working! I’m very grateful. This is so fantastic! Thank you for making an easy-to-understand, easy-to-implement video for this workaround. I was so frustrated but your video did EXACTLY what I was looking for! Also, I was able to take the instructions and apply them to my Squarespace site with no issues. I’ll be coming here for more ConvertKit hacks for sure!